Leather Therapy Restorer Conditioner is an award winner from the inside out to make leather stronger and last longer. Eradicates mold and mildew problems. Shortens new leather break-in period. Leather remains supple and beautiful with increased strength. Leather Therapy Restorer Conditioner is not greasy or sticky. Will not harm stitching or metal. Environmentally sound. Restore that old, dried-out museum piece easily. EPA approved. Shake well before using. Apply to clean leather with sponge. Use sparingly for best results. Test in a hidden area first. 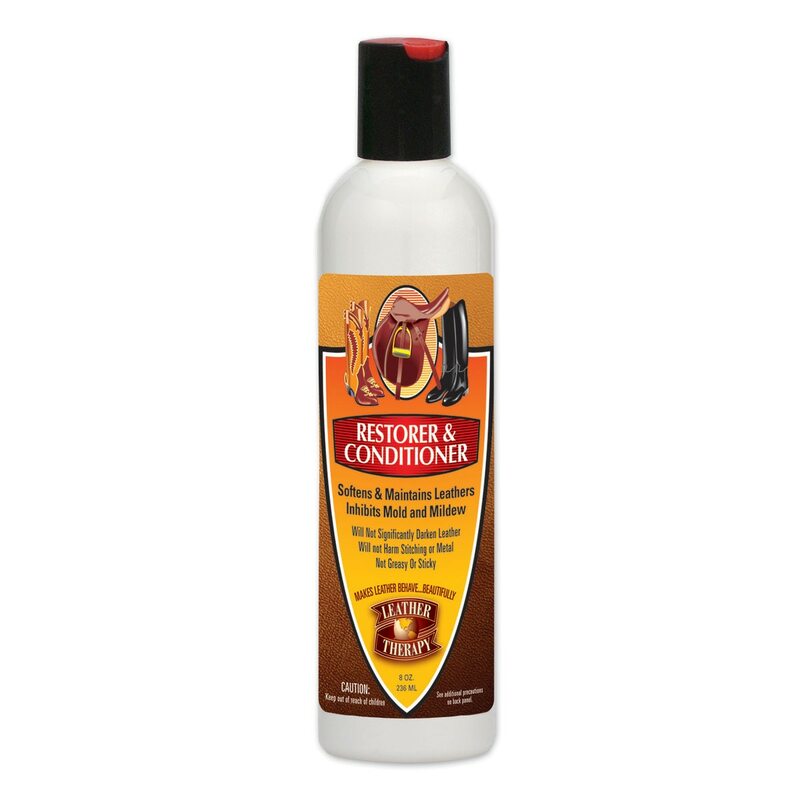 Leather Therapy Restorer Conditioner is rated 4.8 out of 5 by 65. Rated 5 out of 5 by Hailey from Best thing ever! I had a saddle that I bought a year ago and couldn't find cleaners for it. The saddle was super old and I wasn't sure it would last long. I bought this stuff a couple months ago and my saddle looks brand new. I was super happy with results and used it on all my other Saddles too as most of them are pretty old. Rated 5 out of 5 by graciesmom from Only "oil" I will use for my tack I've used Leather Therapy for 10+ years. It's great for my tack and is easy to wash off my hands. Rated 5 out of 5 by Sunny in SC from Great for really dry leather Really good for restoring dry leather. I consider this a 'heavy duty' conditioner which I need since I bad at keeping up with my leather goods! Rated 5 out of 5 by Hbrums from Tack saver I recently moved to the south, and my new barn unfortunately doesn't have a climate controlled tack room. All of my tack was being taken over with mold even with daily cleanings. I bought the conditioner and wash, and there hasn't been a single spore of mold on my tack since. I can't get over how clean my tack feels. I'm a Leather Therapy convert! Rated 5 out of 5 by dvyp1957 from Leather Therapy Restorer Conditioner I have been using this product for years...my absolute favorite leather conditioner. Easy to use and works wonders on tack. A+ product!! Rated 5 out of 5 by My Two Cents from Love this product. We had a few saddles that had a tough summer. We used the Leather Therapy leather wash and then Leather Therapy Restorer Conditioner. Cleaned the saddles and conditioned them so they look like new again. Well worth the money. So pleased with the product I bought some to use as gifts for some horsey friends. Rated 5 out of 5 by ZeldaJRT from Great price, works well! Great product that I've been using for years. Makes leather buttery soft. Rated 5 out of 5 by Karla Jane from Really shaped up my saddle! I used this product after I cleaned up my saddle and the leather just soaked it in! I will continue to use it to keep my saddle soft and horse comfortable! Rated 5 out of 5 by Toltrider from Restored leather on breeches I have a pair of FITS full seat breeches with perforated deer skin that I washed with regular detergent. After several Washington, the leather looked dry and faded. Even though the product directions don't indicate it can be used on apparel, I tried it anyway. I applied it lightly so fabric under the leather was not dampened. The leather is now soft and back to its original navy color. I bought leather therapy wash, which I hope keeps the leather as it looks now. I won't hesitate to reapply the leather therapy restorer conditioner if needed. Very pleased with results. Rated 5 out of 5 by ALA1222 from Great Product I had a chance to use this Leather conditioner. It was easy to use, and made my sofa look new!